Every type of communal life that goes on in the Italian city touches upon the piazza at some point. It seems likely that if you live near a piazza in an Italian city or village, you will visit that piazza at least once in a typical day, and so will most of your neighbours. Vincenzo Pietropaolo and I are sitting on a plane returning from Italy after photographing and writing about piazzas in a number of cities and villages. As he pages through the Alitalia in-flight magazine, Vincenzo comes across a two-page advertisement for food and drink, echoes of la dolce vita. Across the top of the ad, in bold letters, it reads: Italia – Il Regno della Piazza. Italy is indeed the Kingdom of the Piazza, the ubiquitous city square that is a key element in Italian architecture as well as its social, economic and cultural life, and the reason so many Italian cities today remain civilized places to live. Piazzas offer vibrant, diverse spaces that continually recreate and revitalize the urban environment. Many of them also happen to be extraordinarily beautiful. They are stage sets with real-life backdrops: ancient cathedrals, palazzos, baptisteries and fountains, as well as cafes, shops and bars. A crowd gathers to listen to political speeches near the Fontana del Moro, Piazza Navona, Rome. This book was inspired by a vision in one such piazza. Late one afternoon, while I sat in an outdoor cafe on Piazza del Comune in the heart of the city of Cremona (the home of Stradivari), in the northern region of Lombardy, I watched the piazza slowly filling up with local people coming from work or home, stopping by for a visit before the sun went down. In twenty minutes, the nearly empty piazza had filled with about two hundred residents: shopkeepers and salesclerks, mothers and fathers, children on tricycles, priests, young people, old people. They stood about or sat on the cathedral steps chatting. Nothing exceptional, just another day in the life of a small Italian city. Within an open area created by a cathedral, a tower, a town hall and a baptistery, all built seven hundred years earlier, they simply visited with their friends and neighbours. It was clear too that the beauty and extraordinary architectural harmony of the piazza in Cremona were inescapable. Shadows from the crenelated battlement along the roofline of the town hall were perfectly aligned on the columns of the cathedral’s portico across the square. As the sun descended, I watched in awe as each shadow climbed each column. Meanwhile, the sun was coating the west-facing doors and rose window of the cathedral in gold leaf. And so an idea for a book on Italian piazzas was born. An impromptu family reunion outside a church, Tiriolo, Calabria. The first piazza was a mountain meadow where the local villagers and farmers gathered for social or civic events: a wedding feast, a play, a trial. The Greeks bordered the meadow or field with seats to watch games, or circled the space with stone benches to form an amphitheatre. In the cities, they placed the buildings to form an open agora, a community space for the exchange of ideas. For the Romans, the agora became the forum, the center of public life, the place where proclamations were read, the auguries and auspices and other prophecies announced. Ensuring space at the center of a city was an entirely practical consideration – and yet it had far-reaching ramifications. The open square became a gathering place, not only for markets, but also for public games, bullfights, executions, processions, theatre, pageants and spectacles. By the time of the Renaissance, the piazza had become a place to display wealth and power, each square surrounded by cathedrals, towers, palazzos (the town houses of the rich), town halls and other structures. General strike in opposition to social cuts of the Berlusconi government in 2003, Piazza Navona. The sign declares that the the strike is morally justified. The public square grew into a locus of civic pride for the city dweller. At the same time, the possibility to gather on the square helped people define who they were. There was a sense of community, simply because everyone went there – to do business, to visit, for civic events. In some places, they went to the piazza every evening, to walk and talk and look and see themselves and their friends gathering together. Information was exchanged, gossip and rumours were instigated or squelched, old men discussed politics, lovers searched for each other, children played. They are still doing it on many of the squares of Italy – where our sense of a civilized urban life was first defined. One can feel the sense of community there, the natural affiliations. The history of the piazza is intricately entwined with the history of Italy. In Leonardo da Vinci’s Florence, there were fifty piazzas for a population of fifty thousand, exactly one piazza per one thousand residents. In fact, the main square, Piazza della Signoria, was large enough to hold every adult male in the city for extraordinary gatherings. The piazza is a public courtyard, playground and notice board; a sacred space, a shared lobby for a cluster of buildings, a field in the heart of the city, a safe zone, a refuge. The piazzas in this book embody an aesthetic that is typical of numberless village and city squares throughout Italy. They are used for many different functions in a typical day by a majority of residents within walking (or biking) distance. They are used for shopping, for eating indoors or in the open air, for visiting friends or meeting someone for an appointment, sometimes for religious, social or political purposes, for entertainment, for finding love, for curing loneliness. They are often the site of open-air markets or the stage for street entertainers. Impromptu night-time soccer game at Piazza della Repubblica; Pizzo Calabro (Calabria). Every type of communal life that goes on in the Italian city touches upon the piazza at some point. Sometimes the city hall can be found across from the cathedral, so you can pass through one door to acquire a marriage license and enter another door directly across the piazza for the wedding. Piazzas are the site of baptisms, rallies, speeches, marches and candlelight processions, festivals, people watching and funerals. 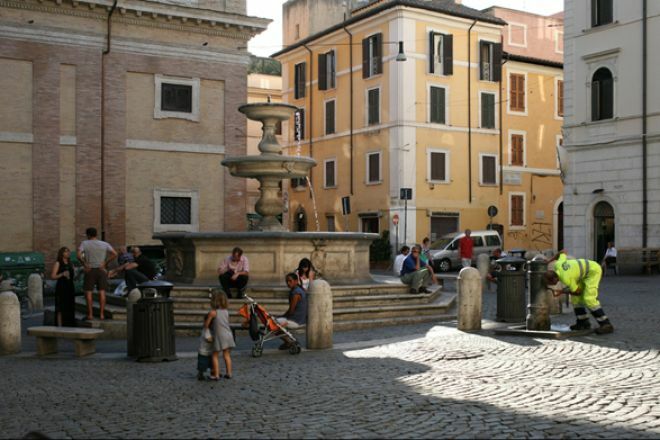 It seems likely that if you live near a piazza in an Italian city or village, you will visit that piazza at least once in a typical day, and so will most of your neighbours. Students will cross the piazza to get to school in the morning and to return home in the afternoon. Waiters, cooks, civil servants and shopkeepers will pass through on their way to work. Old men and old ladies will wander down in the late morning for a coffee and a bit of gossip, while schoolchildren arrive en masse to visit the cathedral. Local workers will come for lunch or stop off for a quick espresso. Those with time on their hands will linger over a cappuccino or a glass of wine in the afternoon. Later, housewives will come to buy meat, bread, cheese or vegetables at small shops. In good weather, the outdoor cafes will fill up with diners in the evening, and later, young and old will descend on the piazza for an ice cream or a glass of prosecco. People will come to attend concerts in the cathedral or to linger about the fountain, to see who is there and who is not. All paths crisscross here – the piazza is a site of constant human activity. A man rides a bicycle in Piazza del Popolo, Ascoli Piceno, Marche. Vincenzo Pietropaolo is an internationally acclaimed photographer, born in Calabria, Italy, and living in Toronto. He has published over a dozen art and photography books, and is recognized as one of Canada’s pre-eminent documentary photographers. Excerpt from Where Angels Come To Earth: An Evocation of the Italian Piazza by Mark Frutkin and Vincenzo Pietropaolo (Longbridge 2019 – forthcoming). Next Next post: Who Can Sell Books on the Accenti Bookstore?